When you have a handy kitchen knife, you want to make sure you keep its blade as sharp as it’s always been. You also don’t want it lying around in your kitchen where any of your kids can just pick it up or accidentally cut themselves. Whether you have a large or a small kitchen, a good knife storage will always be a must to keep these cutting tools safe yet accessible. We’ve listed a good number of sound and practical storage ideas for your kitchen knife that may just cut it for you and your family. One of the best ways to store your knives so that they are easily within reach, but are safe and off the counter, is in the drawer. Instead of leaving your knives loose in the drawer, which can be very dangerous and cause somebody to easily get cut when reaching in for a knife, buying in-drawer storage is a wonderful way to keep your knives organized and ensure that everyone in your family is safe. These storage options fit neatly into an average drawer in your kitchen and will then hold the knives inside of them so that when you open and close the drawer, they do not shift around. Not only does this ensure that people do not cut their fingers on your knives, but this will also keep your knives from accidentally dulling in the drawer. If you don’t have a lot of countertop space, then this is a wonderful option for your kitchen. A great option to keep knives safely out of the way, without taking up precious countertop space or filling an entire drawer in your kitchen, is to store them in an under cabinet block. This type of storage is actually hidden, which is ideal if you have a small kitchen and do not want a lot of visual clutter. It’s a perfect way to keep your knives close to hand, but still out of the way so that younger members of the family cannot accidentally grab them. An under cabinet storage will actually attach to the bottom of your hanging cabinets, which allows you to pull down the storage when you want to access your knives, and push it back up and out of the way when you do not need them. They are made of incredibly durable materials and have reliable hinges so that you don’t have to worry about the knives accidentally falling all over your countertop. These do tend to cost more than other types of knife storage, but if you want your knives stored out of the way where nobody can see them, then this is likely to be one of your best options. Countertop knife storage is the most common type of knife storage that you will find in most kitchens. The best way to store your knives within easy reach of your cooking area is in a quality and durable knife block that will protect the blades of your knives so that they do not get dull. If you buy your knives as a set then it is very likely that your set will come with a knife block that is perfectly designed for the shape of your blades. If you do not have a knife block, then it’s smart to find some sort of storage that will protect your blades, rather than simply placing your knives in a jar or other container. While some homeowners like the look of knives stored freely in jars, this is a very dangerous situation and will shorten the life of your knives. Knife blocks are a popular countertop storage option because they come in all sizes, colors, and materials, so you can easily choose one that will meet your needs and match the décor of your kitchen. Wall storage is becoming more and more popular as homeowners move to smaller homes and have less storage space in their kitchens. Depending on how many knives you have, you can easily choose a wall storage option that will meet your needs and safely store all of your knives within reach, but up and out of the way. Larger storage options are similar to giant knife blocks that are firmly attached to the wall and they make it possible to store a number of different knives all at once. The blades are kept completely encased in this type of wall mount, so you never have to worry about somebody grabbing them off of the wall and becoming injured. Another popular type of wall mount for your knife storage is a simple strip of magnetic metal, which will hold your knives flat against the wall and not take up nearly as much space as a bulkier option. If you are going to be traveling with your knives, then you need to make sure that you have storage for them while you are on the road, otherwise, you may find that they damage your luggage and put you and your family at risk. A knife storage bag is specifically designed for taking your knives with you while on vacation. These are very popular among chefs, but home cooks can benefit from them as well. They will have separate slots inside where you can place your knives, and they are often rolled or zipped up into a compact bag that you can carry with you. When you are shopping for a knife storage bag, make sure that it has plenty of slots for the knives that you want to take with you, has a durable handle, and closes securely, so that you do not have to worry about your bag accidentally coming open when it is being carried. While not nearly as common as other types of knife storage, pop-up knife storage is becoming popular in modern and sleek kitchens. This type of storage is actually built into the countertop in your kitchen and uses a mechanism to allow somebody to open and close it by pushing the top of the knife storage. 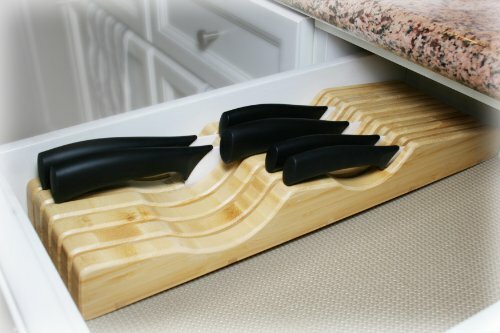 This storage system drops down into your countertop so that your knives are hidden completely from view at all times until you press the top of the storage. By pressing the top, the whole storage system will gently slide up out of the counter so that you can choose which knife you want to use. Pushing the knife storage back down into the countertop will allow the user to click it into place so the knives are stored inside of your countertop. By storing your knives in the recesses of your kitchen, you can save a lot of space and ensure that you decrease the amount of clutter on your countertops. The problem with this type of knife storage is that it does take installation, instead of being simply put on the countertop or placed in a drawer. This means that the homeowner wanting to install it has to understand basic woodworking so that the unit looks professional and clean when used. A sheath is a great way to protect an individual knife blade from being damaged. Whether you want to store a special knife in a drawer, out of the way, or you are bringing it with you on a trip and have not invested in a larger back for all of your knives, buying a sheath will allow you to protect your knife from any sort of damage. This will also prevent members of your family from becoming injured when they reach into the door to choose a knife. 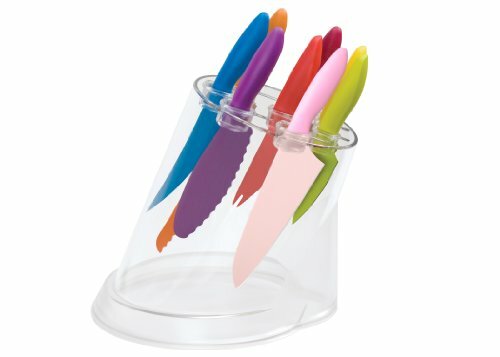 Plastic knife holders are not terribly popular because they can be so easily damaged by the sharp blades of your knives. That being said, they are a great option for anybody who needs to buy knife storage but is on a strict budget. Another problem with plastic storage is that it tends to look a little lower quality in the kitchen. Often, you can find knife storage that is only a little bit more expensive but made out of a higher quality material. If you do decide to use plastic for your knife storage, make sure that you do not accidentally nick it with your knives, as this will dull the blades, causing you to have to get your knives sharpened more often and spend money on a better quality knife storage. One of the most popular materials for knife storage is bamboo. When you buy knife storage made of this material, you can rest easy knowing that it will be lightweight and easy to move around in your kitchen. Additionally, due to its weight, you can easily empty out the storage and clean it if it gets dirty, which ensures that your knife storage always looks the best that it can. Bamboo is fairly tough and quality bamboo knife storage units will be able to stand up to years of use before showing wear and tear. This means that you do not have to worry about your blades becoming dull when in this type of storage. If you are going to be buying a bag for your knife storage, then you have to consider the quality of fabric that is used in its construction, as this will play a huge role not only in how safe your knives are while you are traveling but also how long your storage will actually last. Lower quality fabrics will not stand up to years of use the way heavier materials such as canvas will, and this means that you will have to spend much more money buying new storage for your knives. When shopping for a fabric bag for your knife storage, you also need to consider the quality of the zipper used. Make sure that it is heavy duty and has been carefully attached to the bag. Check the seams for double stitching, and make sure that all of the corners have been reinforced, so that you don’t have to worry about your bag falling apart when it is full. Unlike other materials, the fabric can be easily damaged by the sharp blades of your knife, which is why it is so important to make sure that the material is of good quality. Metal knife storage is not nearly as popular as other materials, but for the right person and in the right kitchen, it is a wonderful choice. It is not nearly as gentle on your blades as other types of material, such as bamboo, can be, but that doesn’t mean that you can’t use metal knife storage and still retain a sharp edge on your blades. You simply have to be careful when using your storage so that you do not heat your blades on this hard material. Metal knife storage is a great option if you have an industrial look in your kitchen and want your storage to match this appearance. While there are some knife locks that are metal, it is much more common for a magnetic strip storage option to be metal. Many homeowners love the look of exposed metal in their kitchen, and this adds an interesting touch to your cooking space. Wood is one of the most popular materials for knife storage that you can buy. That’s because it not only looks great, but it is very durable and easy to clean, it will last for a long time, and it generally won’t hurt your knives. When shopping for wood in knife storage, you will want to take into consideration the color scheme in your kitchen so you can pick an option that will fit in. It’s also important to make sure that when you use your wood knife storage that you do not hit it repeatedly with the edges of your blades when putting your knives in, as this will cause some damage. While most people want to have all of their knives in one location in their kitchen if you want to have certain knives spaced around the room depending on where you use them, then opting for a set is a great way to buy a knife storage. This, of course, will mean that your various pieces will not hold as many knives as a larger storage option will, but you can create a modern look in your kitchen by spacing out your knives around the room. Because the set will be similar in size, shape, or material, you can rest easy knowing that there is a unifying theme running throughout the kitchen, which will create a cohesive look. It is not very common to find clear knife storage, but this is a wonderful way to really get to see your blades while your knives are not in use. While some people want to have their knives stored completely out of sight when they are no longer in use, clear storage allows homeowners who have spent the time and money to buy attractive and functional knives to show them off. This feature does not add to the durability or function of the knife storage, but it is simply there for aesthetic appeal. If you are going to be storing your knives on a strip on the wall, then it’s important that it is magnetic and strong enough to hold the weight of your knives. Lower quality magnetic strips may be able to hold a knife or two, but more knives can tend to be very heavy and weigh down your storage if you’re not careful. This can actually cause your knives to fall off of the wall, which will greatly damage their blades and even leave holes in the floor or the countertop. It’s imperative that you follow installation instructions when attaching a magnetic strip to your wall. While some people love the industrial look that this type of storage brings to the kitchen, others are understandably concerned about having knives stored in such an exposed manner, as it is important to keep them out of the reach of small children. Carefully selecting where you will place a magnetic strip is important, so you don’t have to worry about the safety and security of your family. A perfect gift for the cook or chef in your life is a personalized knife block. This is a great gift to give anybody to commemorate a special event in their life, such as graduating from culinary school, getting married, or retiring. When you are in the market for a personalized knife storage option, then make sure that you work with somebody who offers not only quality personalization work, but also provides a durable and attractive knife block for the personalization. The last thing that you want to have happened is your recipient to love the personalization put into the storage, but not feel like the storage can actually meet their needs. If the storage option isn’t durable and attractive, then it is very likely that your recipient will not use it. Unlike some types of knife storage that have slots specifically sized for various knives, universal knife storage will allow you to put any type of knife into the storage, without worrying about whether or not the blade will be damaged or the knife will be too loose and fall out. Magnetic strips are considered a form of universal storage, but one of the most popular types is a knife block that has a material inside where you put the blades that will separate as the blade enters and then form back together when you remove the knife. This means that your knife is always held securely, so it will not rock or fall and that your blade will not be damaged. While most people are going to have more than just three knives to store, sometimes it is a good idea to keep very special knives by themselves. This ensures that nobody uses them by accident when cooking and that they retain their sharp edges. It’s very important that you buy knife storage that will be able to meet your needs, and another factor to consider is the size of the storage. 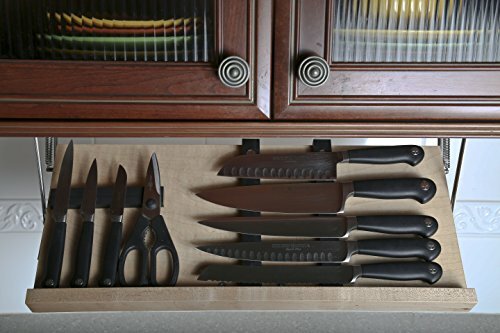 Many homeowners, unless they are avid cooks or chefs, can get away with a knife storage option that only holds 4-8 knives. As an added bonus, this type of knife storage is significantly smaller than larger options, which means it will take up less room in the kitchen and can be stored out of sight when you want an uncluttered look. Generally speaking, this is a perfect size for most families. It offers enough room for a number of different types of knives, so you don’t have to worry about leaving any in the drawer where somebody could be injured. A little larger than most people need, this size of knife storage will offer plenty of room not only for specialty knives for cooking but also for any steak knives that you want to store in your storage. This keeps them safe and ensures that nobody grabs the blade out of the silverware drawer. While it may seem that only professional chefs will need to buy storage that can hold these many knives, it is becoming more and more common for people to attempt elaborate dishes at home and to hone their own cooking skills without ever having stepped foot in culinary school. If you have an interest in cooking and want to make sure that you always have enough storage for your knives, then it is important that you make sure that you buy knife storage that will offer you enough space for your collection. Buying a knife block that is a little too large is usually a good idea, as this will allow your collection to grow without you having to invest in another storage option in the future.